KISS your old drinks goodbye! This all natural, flavor-infused simple syrup (also known as “KISS”) began as the quintessential solution to coffeehouse syrups loaded with artificial ingredients and bars lacking fresh mint for their Mojitos. Founder Susan Martinson developed the recipe in her Richmond, VA home. It came about as a shortcut she took while making a Mojito, the popular and refreshing summer cocktail made with fresh mint, lime juice, rum, and dissolved sugar. Rather than muddling the mint leaves, she simply tossed them into a pot of boiling simple syrup and let them steep. To her delight, this step extracted the unmistakable flavor, aroma and color of the leaves, and inspired her to make it available commercially so that anyone could make high-end cocktails at home with minimal effort. A few years later, this premium product hit the market as a top-shelf mixer at state-run ABC liquor stores in Virginia, where the standards are high for Sweet Southern Tea and Mint Juleps. 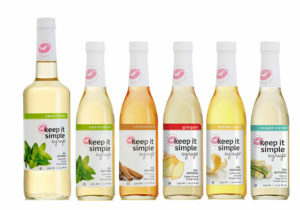 Keep It Simple Syrup is now available in more than 200 Virginia ABC stores, more than 400 Pennsylvania Fine Wine & Good Spirits stores, at select retailers, and online. We have five varieties: Spearmint, Lemon Zest, Cinnamon, Ginger, and Sugar Cane. All are packaged in 375ml bottles. Spearmint is available in a 750ml size as well. What sets Keep It Simple Syrup apart from basic, unflavored simple syrup? INFUSED WITH NATURAL FLAVOR: Traditional simple syrup is unflavored. Steeping genuine botanical ingredients infuses KISS with natural flavor, color, and aroma. ALL NATURAL INGREDIENTS: Most brands use artificial sweeteners such as high-fructose corn syrup, artificial preservatives, colors, and flavors. KISS is made with pure cane sugar, and it’s completely free of artificial additives. VERSATILE: Unlike mixers that are cocktail-specific, e.g. Margarita mix, Daquiri mix, KISS may be be used in a wide variety of cocktails, as well as non-alcoholic beverages, savory dishes, and desserts. How many cocktail mixers can make the same claim? Keep It Simple Syrup is fat free, gluten free, certified kosher by the OU, and proud to bear the Virginia’s Finest® trademark. Enjoy it in coffee, tea, & water. With many uses for the creative cook, it makes a unique gift, and having it on-hand for entertaining offers convenience and quality – a rare combination. Why make your own simple syrup when you’ll have to wait for it to cool down? KISS mixes well with virtually any spirit. Ask for it at premium liquor stores, gourmet retail shops, and your favorite coffeehouse. As consumers we’ve become so accustomed to fancy beverage brands that we’ve lost sight of what we’re adding to them. Take a look at the ingredients label the next time you’re in the Mixers aisle at the liquor store, or deciding on a flavor for your latte. Demand more in your drinks!